PROVIDENCE, R.I.- (October 6, 2013) - A crowd of 8,000 came to Roger Williams Park on Saturday, October 5, to enjoy the electrifying racing at the nation’s most prestigious cyclo-cross race, the UCI Category 1 Providence International. The stadium seating at the Harpoon Beer Garden filled to capacity soon after opening, with spectators grabbing an early seat for a perfect view of the action. The sound of cowbells filled the air and world-class racing filled the schedule on the warm autumn afternoon. The Providence International is part of the three-day Providence Cyclo-cross Festival. The festive mood took a somber turn before the start of the day’s elite events, as the loudspeakers went silent and hundreds of riders entered the course for a silent lap in honor of professional cyclist Amy Dombroski, killed in a tragic training accident in Belgium last Thursday. The Jericho, VT native rode for the Belgian Young Telenet Fidea team and was loved by her fellow professionals for her positive attitude and respected for her racing fortitude. It was an emotional ride for many; tears flowed and riders hugged. Then, like bike racers do, they regained composure and prepared to race. One would be hard pressed to find a women’s field with more depth than was racing in Providence. The race quickly strung out single file on the twisty, technical course. By the third lap of the six lap race, a break formed with Compton (Trek Cyclocross Collective), Nash (LUNA Chix) and breakout talent Elle Anderson (Cal Giant/Specialized) separating themselves from a lead group of eight. With two laps to go, Nash pressed the accelerator and Compton and Anderson were unable to respond. Nash extended her lead to seven seconds over the final two laps, enjoying the adulation of the crowd as she crossed the line. Behind her, Anderson and Compton sprinted for second and third, respectively. The elite men received rock star treatment at the start, emerging one by one from a smoke filled tent for the start up. The Providence International was graced with Providence Mayor Angel Taveras delivering the course instruction. It was a usual group of contenders, save one, forming the winning break on the dry, dusty course with Ben Berden (Raleigh-Clement), Ryan Trebon (Cannondale/Cyclocrossworld.com), Tim Johnson(Cannondale/Cyclocrossworld.com), and Jeremy Powers (Rapha-Focus) separating themselves in lap five of the ten lap race. The four were joined by Canadian Raphael Gagne (Rocky Mountain Factory), a mountain biker showing exceptional form on the dry, dusty course. It was a boxing match into the final laps as riders threw jab after jab. Powers delivered the knockout punch on the final lap, shortly before the final transition to the pavement. Powers had enough time to savor his victory as he was welcomed home by a crowd three deep, stretching from staging to the finish line. Berden outsprinted Johnson for second spot on the podium. “I’ve raced in Providence since 2005, when it hosted nationals. It’s always nice to be able to win in front of my friends and family,” said Powers. 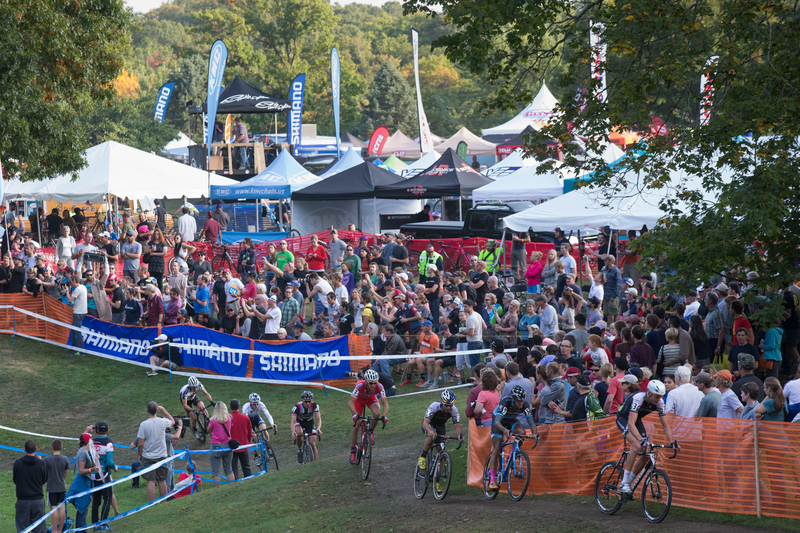 Photo caption-Crowds watch as the Elite Men’s race, led by Ryan Trebon, snakes past the Harpoon Beer Garden at the Providence International in Roger Williams Park.